Published monthly, Stamp Collector includes everything you need to build your collection, every month. The regular market insight pages provide dealer advice, tips and price updates, giving you all the information and knowledge to buy and sell with confidence, whilst our expert collecting articles shed light on the background of stamp issues, detailing why – and how – you should add them to your collection. The magazine also celebrates the many different aspects of philately, showcasing a collector’s exhibit in each issue, and featuring insightful guides to postal history, collecting by theme, first day covers, postcards, and postmarks. Each issue, we preview the latest stamps from Royal Mail (and give readers the chance to win the set), take a tour around the islands to examine the latest stamps from Guernsey, Jersey and the Isle of Man, and provide a comprehensive listing of new stamps issued around the world. But Stamp Collector is more than just a magazine. 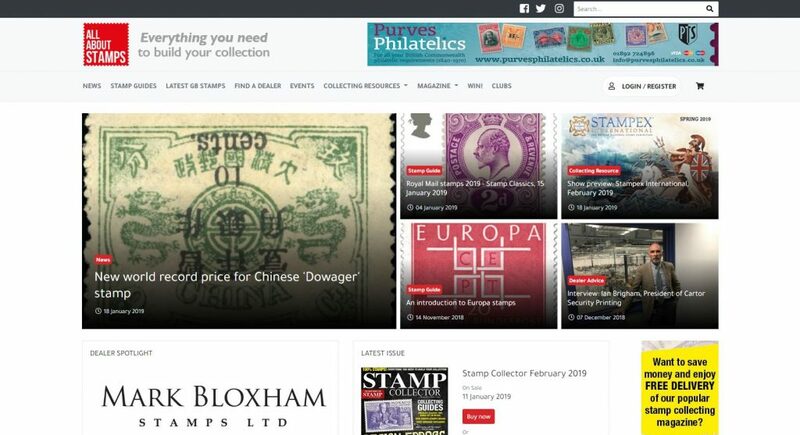 Our popular website (www.allaboutstamps.co.uk) provides daily updates, guides and a dealer directory, whilst the magazine includes extras including the annual PTS dealer directory (the ‘yellow pages of the stamp trade’), the official Stampex show guide, and limited edition postcards.